Happy Constitution Week! September 17th through the 23rd is an exciting time in America. We have the opportunity to celebrate and honor the United States Constitution. Our Constitution has endured longer than any other constitution in the world. Imagine being in Philadelphia that long, hot summer in 1787. Citizens of Philadelphia, Pennsylvania see the many influential men arriving in their city from all over the 13 states. Retired General George Washington’s arrival is celebrated with cheering, church bells ringing and a thirteen-gun salute. What will the citizens of the young nation have for governing and laws when they are done with the Constitutional Convention? 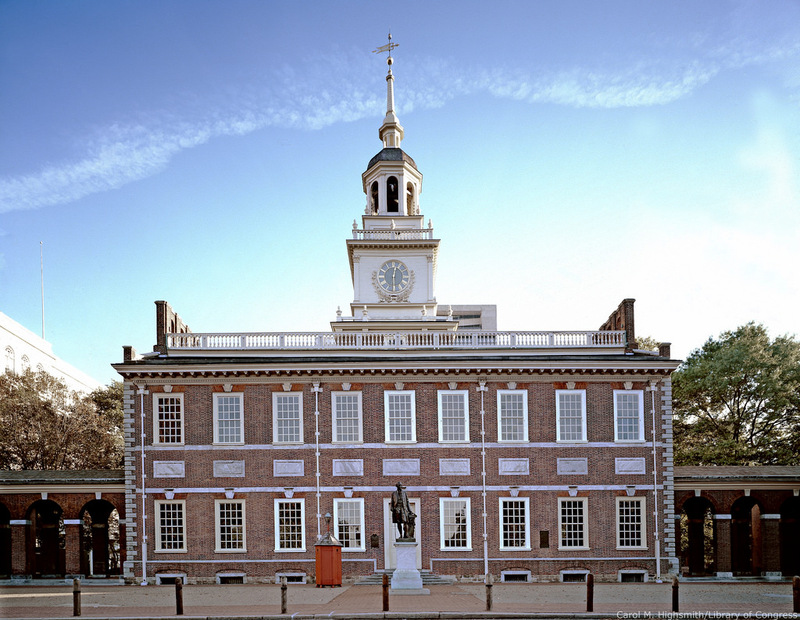 On May 14, 1787, the Convention begins. The debates are being held in secret, behind locked doors that are guarded by sentries, even the windows are closed. Fifty-five of the seventy state delegates are attending the convention. George Washington, serving as a delegate from Virginia, is elected unanimously as the President of the Constitutional Convention. Virginia delegate James Madison, known as the “Father of the Constitution,” wrote The Virginia Plan. He is the driving force behind the convention. The first two months see angry arguments by The Committee of the Whole* over The Virginia Plan. The Virginia Plan’s fifteen resolutions expand the debate to incorporate what method of structure and authority the national government will have to administer the laws. It is the first test to create a separation of controls into an executive, legislative and judicial branch. The Virginia Plan also recommends that the legislative branch should be comprised of two houses. In the two houses, each of the states will be represented in proportion to their populations. States with a large population will have more representatives than smaller states. The larger states approve of this notion, but the smaller states do not. The New Jersey Plan, written by New Jersey delegate William Paterson proposes a single chamber legislature in which each state, regardless of size, would have one vote, as under the Articles of Confederation. The delegates find this plan unacceptable, too. The Connecticut Compromise, written by Connecticut delegate Roger Sherman proposes “The Great Compromise.” Sherman’s compromise suggests that each state be equally represented with a creation of two houses. The first house, the House of Representatives, would have representation according to population, and the second house, the Senate, would have an equal number of representatives regardless of population (2 per state). Pennsylvania delegate James Wilson proposes the idea of an individual for the executive branch with direct election by the citizens. The individual would have absolute veto powers over the legislation passed by the two houses. Some delegates fear the veto power and want election of the individual by the Congress. The final compromise is the president would have limited veto powers and be elected by the people—through the establishment of the electoral college. On July 24th, the Committee of Detail* is authorized to carry out the writing of a draft of the Constitution. The convention adjourns from July 24th to August 6th. For thirteen days, the five-man committee—Edmund Randolph, Oliver Ellsworth, James Wilson, and Nathan Gorham work with chairman John Rutledge, referencing state constitutions, the Articles of Confederation, plans submitted to the convention, and other relevant material. The Declaration of Independence is also used as an important model for its outline of ideals of self-government and fundamental human rights. On August 6th, the convention reconvenes. The Committee of Detail* presents approximately 60 copies of its work to the delegates. These copies are used by the delegates as they work through each clause to create a final constitution. The Preamble, written by Gouverneur Morris, is added as the opening to the Constitution during the last days of the convention by the Committee on Style* which writes the final draft. It was not proposed or discussed on the floor of the convention beforehand. The final draft is done, ready for ratification, and the signatures of the delegates. However, not all the convention delegates sign the new Constitution. Virginia delegate George Mason authored the Virginia Bill of Rights. Mason refuses to sign the Constitution because he is very concerned about the power given to the federal government and the delegates refusal to end the slave trade. Mason commented “I would sooner chop off my right hand” than sign a Constitution without a Bill of Rights. Mason’s need to have the rights and freedoms of the country’s citizens precisely detailed was eventually preserved in the first ten amendments of the US Constitution. Virginia delegate Patrick Henry and New York delegate George Clinton also refuse to sign and are called “Anti-Federalists.” They prefer the reorganized nature of the Articles of Confederation as a check on the power of the central government. Others express reservations but thirty-four still sign, anticipating vigorous debates within their states. The five signatories who sign the Constitution but did not serve in the Continental Congress were Richard Bassett of Delaware, Jacob Broom of Delaware, John Blair of Virginia, Charles Cotesworth Pinckney of South Carolina, and David Brearley of New Jersey. On September 17th, the Constitution is ratified and signed. By June 1788, the necessary nine states ratify the Constitution as the law of the land, and the Continental Congress announces that the new government will begin in March 1789. James Madison, a newly elected member of the U.S. House of Representatives, presents 19 amendments to the Constitution. On September 25, 1789, Congress adopts twelve of the amendments and sends them to the states for ratification. The first ten amendments, known as the Bill of Rights, are ratified and become part of the Constitution on December 10, 1791. Today we have twenty-seven amendments. The seventeen amendments that follow The Bill of Rights were added from 1798 to 1992. The framers of the Constitution knew that no document could include all the changes that would take place to guarantee its longevity. The process isn’t easy–after a proposed amendment makes it through Congress, it must be ratified by three-fourths of the states. #TBT 125 years ago, on April 19, 1894, the Sequoia Chapter in San Francisco, California, planted a �... 19 hours 56 min ago.